Henry Cashell's will and Rebecca White's will (genealogical abstracts), [Betham abstracts] vol.8 p.74, [NLI] GO Ms 230, [NLI] microfilm POS 1220 (illegible). Rebecca White's will (transcript), [NAI] T 20266. This has genealogical comments dated 1972 by James M. Niall. "Freemen of the Corporation of Fethard, Co.Tipperary", "Extracts from the Minutes of the Corporation of Fethard", The Irish Genealogist, 616, vol.4 no.6, Nov 1973. "Nihell of Co. Clare and Co. Limerick", James M. Niall, The Irish Genealogist (NOT The Irish Ancestor) vol.4, no.5, 1972, pp.496-506. William Harrison's will (genealogical abstract), [Betham abstracts] vol.13 p.66 [NOT 166], [NLI] GO Ms 235. 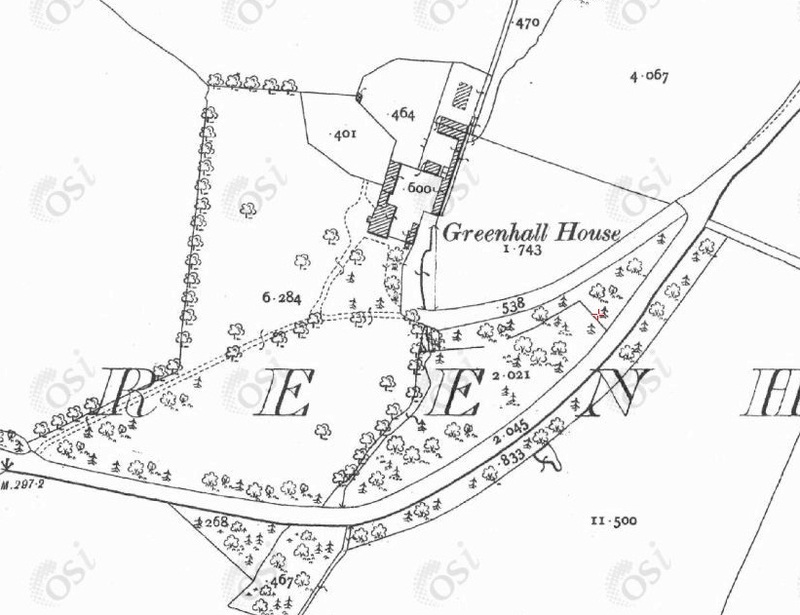 Greenhall House, Co.Tipperary, in 1887 to 1913 map. See also 1829 to 1842 map. See modern satellite view and street view of entrance. There is apparently a ruined old house at Greenhall today. Henry supposed to have died intestate 17th July 1790. Though he must be Henry Cashell, who died 9 Jan 1789, at or near Garruragh, Co.Clare, "by a fall from his horse", bur Killaloe, Co.Clare, see [Hibernian Chronicle, 22 Jan 1789], (todo) see Limerick Chronicle. His father-in-law William Harrison's will dated 5th Mar 1791, he died 1791, will pr 20th July 1791. Admin. of his goods to his brother Francis Worth Cashell, 8 Feb 1799, (todo) see [Betham abstracts], 13, 102. "Henry Cashell" of Dublin is listed as owning freehold of [poss. Island McTurlo], Co.Tipperary in 1776. "Francis W. Cashell" is listed as living Bushfield in 1814 Directory. also seems to conflict with Cashel having left Bushfield (and it as property of Henry G. Cashel, being rented out) at that time. He must be Benjamin Cashell, of Dublin, gent, admitted 1774 as [Freeman of Fethard]. had a son Benjamin, who must be named after his grandfather Benjamin. Henry G. also claims in 1866 to be the heir of land occupied by "Mrs. Christina Russell", who is perhaps the widow of his Russell 1st cousin. mar Samuel Bennett [of Balincoola] and had issue. mar Oct 1795, Fedamore, to Henry Bevan and had issue. Sarah Furnell, mar Samuel Bennett [of Ballinvana] and had issue. Honora Furnell, mar William White. Eliza Furnell, mar Terence O'Brien. Henrietta Furnell, mar Edward Bennett. died 16 Jan 1787, age 2 yrs. researching family tree. See posts from her (and more) including posts on Cashel and Blennerhassett. Apparently it was noted in the obituary of one of the Crottys that grandmother was from "prominent Cashel family". Also in the Crotty family when a child is named Francis, usually the second name is Cashel. This would suggest that Rebecca is granddau of Francis Cashell. died 6 Jan 1812, at the house of Francis Cashell, Co.Tipperary (probably Francis above), (todo) see Limerick Evening Post. This may be the Russell family mentioned in Henry G. Cashel's Power of Attorney 1866 as having land in Kilmastulla par [nr Bushfield], N Co.Tipperary. to Capt. Richard Harte [poss. Hart] of Ballyculleen [or Ballycullen], Co.Limerick. as at 1972 address was P.O. Box 276, Manuka, Canberra, A.C.T. 2603, Australia. mar 1818 to Mary Anne Bevan. She might be "Mrs. Mary Anne Cashel", living Booterstown Ave, Booterstown, Co.Dublin, in [Griffiths Valuation, 1849]. She might be "Maryanne Cashel", living Mill St, Borrisokane, N Co.Tipperary, in [Griffiths Valuation, 1852]. see Freeman's Journal, 6 Dec 1820.
also notice in Daily Southern Cross, 6 July 1870, Page 8.